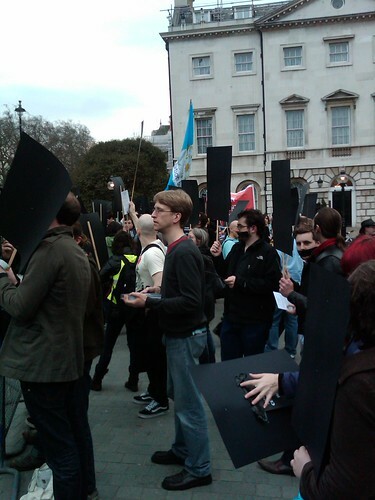 On Wednesday, I attended the "Stop Disconnection Demo" to protest the Digital Economy Bill outside parliament. I've been on a few protests in my time. Anti-war, anti-nukes, anti-tuition fees and the like. This was one of the most cheerful protests I've ever attended. 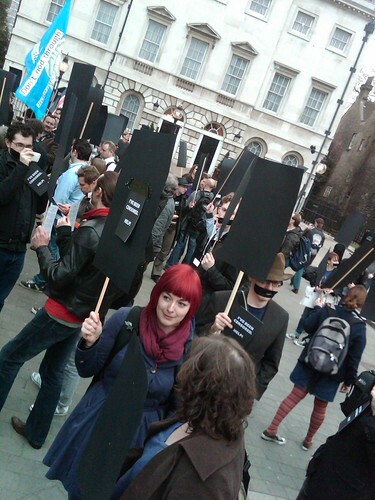 The protesters were friendly and erudite. Passers-by seemed happy to take our literature. The speakers - while hard to hear - spoke with knowledge ad passion. Even the police (!) were charming and even took some of our leaflets. Despite what El Reg reported, there was a good crowd there - maybe 250 people. Overall, a worthwhile and useful day. Please, write to your MP to ask them to debate this bill.